Welcome to beekeeping! You’ve got your bees. Sugar syrup, mixed 1kg granulated sugar to 1 litre water. Place nuc hive in position on the hive stand. Leave the bees to fly and to settle down for a few days. Do not be tempted to transfer the combs to a hive straight away. The bees will be furious! 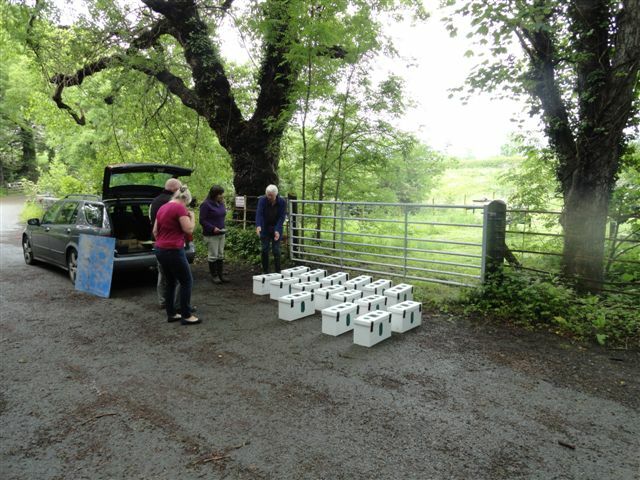 Decision….. Do you want to run your hive warm way or cold way? Warm way, with the frames parallel to the entrance allows you to work the hive easily from behind. Cold way requires you to twist if working from behind. I only use warm way. Choose a warm sunny day when the bees are flying well. 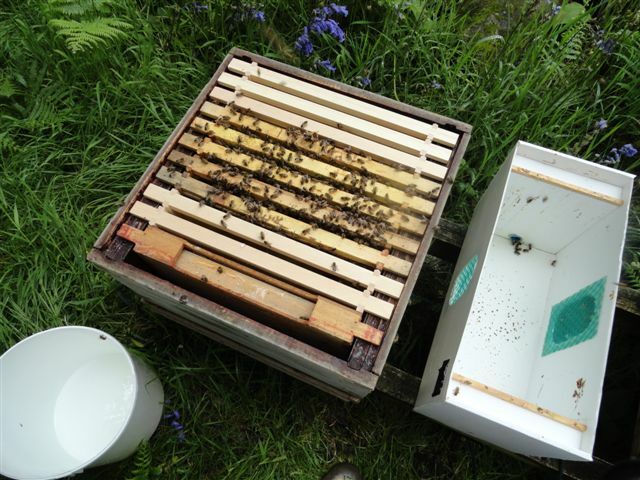 Move nuc hive to one side and place your new hive on the stand, with the entrance block in place to reduce the entrance. 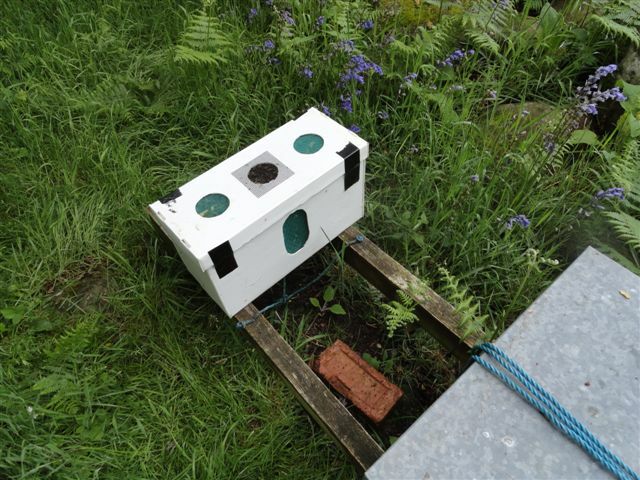 Place empty frame feeder and one frame of foundation in brood box at back. Open nuc hive and gently smoke your bees. Lift out first frame of bees and place in hive, next to the first frame of foundation. Continue to transfer frames of bees, making sure that they are the same way round as in the nuc hive. Add one frame of foundation at front. Push all frames towards the back, leaving a gap at the front. Fit a dummy board in the gap, up against the frame of foundation. Note: The picture shows three frames of foundation at the front and two at the back. It is better to add frames gradually, as the bees build up in numbers, or the bees will struggle to keep the brood warm. Shake any bees still in the nuc hive into the new hive. Fit crown board and empty super. Fill in a new hive record card. The same evening, give the bees a feeder full of syrup, 2 x 1kg sugar mixed with 1½ litres of water. If you feed when the bees are flying you may cause other bees to rob the hive. Continue feeding until the bees have drawn out all the frames of foundation. 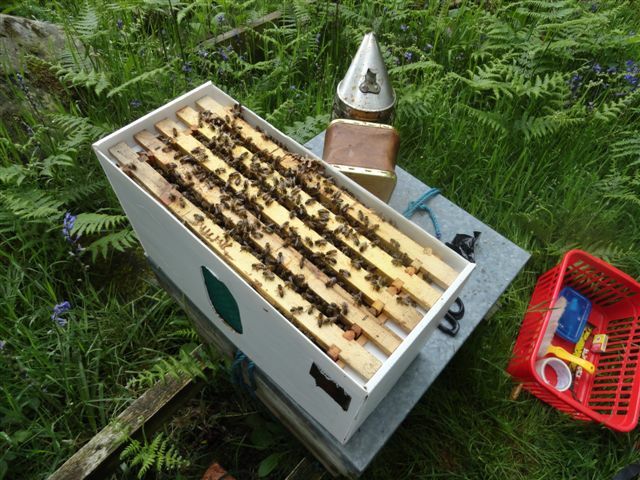 Aftercare….. Be aware that if you are using a nuc provided with a queen raised last year your nuc could make preparations to swarm, long before they have built out the brood box with drawn comb. These notes are also available to download. would like to know how you can assit in marketing of honey and wax. Thanks for the advice. A great site.I’m still learning after a year with three hives. Have just collected two new nucs and needed to check before installing. 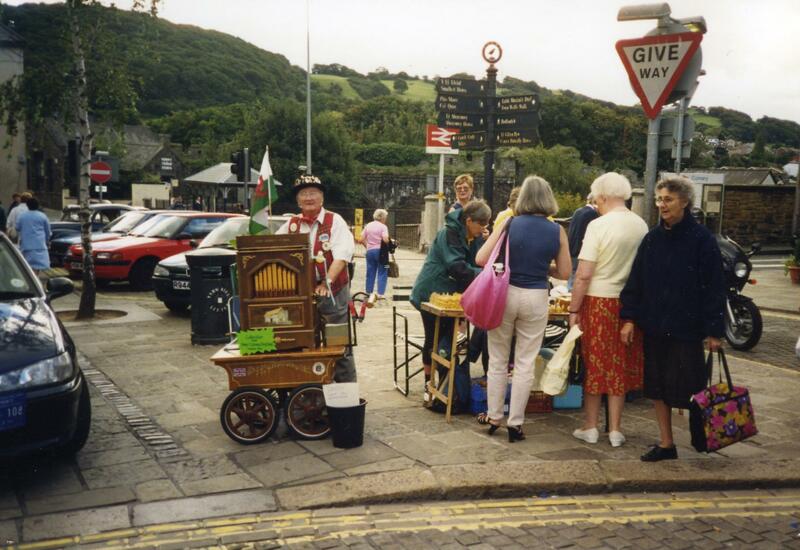 Love seeing how things are done in Wales and learning the new vocab. I only know it in French having learned here in South Western France. Thanks for your message Cate. Glad you like our website. I’m still learning after 37 years with bees! Every year is different. How are you coping with Asian hornets? We don’t have them in the UK yet.